LOCAL PROBLEMS and opportunities demand local solutions and initiatives. That’s one of the messages Ben Stone delivered to a gathering of 30 neighborhood leaders, government officials, and advocates Aug. 9 at Bull Street Labs. 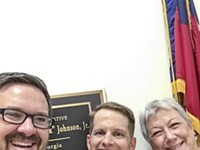 Stone, director of arts and culture at Smart Growth America, and Emiko Atherton, director of the National Complete Streets Coalition, were invited to Savannah by Georgia Bikes, the statewide advocacy organization. It’s hard to imagine a city in which Stone’s comments would have received more nods of agreement. One thing I’ve learned in almost 25 years of living here is that Savannah likes to do things its own way. The “we don’t care how they do it in other places” attitude produces both positive and negative consequences. On the plus side, it’s preserved Savannah as a place all its own, as other cities became more homogenous. Not so helpful is our tendency to instinctively reject promising new ideas that would deliver numerous benefits if implemented here. Part of this stems from our reverence for the past. But rather than protecting the legacy of Oglethorpe, we often seem focused on keeping things exactly the way they are right now. Again, this probably acts as a guard against sliding toward “Anyplace, USA.” But it also leaves us unprepared for disruptions that are coming whether we like them or not, especially in the transportation sector. For instance, we are perpetually fixated on the need for more parking garages. Yet there is growing evidence that demand for structured parking will wane. A Wall Street Journal article from earlier this year, “Say Goodbye to Garages as Developers Imagine a Driverless Future,” reports on architects designing garages from the start for conversion into office or residential space. As I write, the latest transportation disruption has not yet arrived in Savannah, but it may be here by the time you read this. Last week Connect Savannah Editor in Chief Jim Morekis wrote “Beware the Bird” about the arrival of dockless, sharable electric scooters in Charleston, highlighting the potential for injury to pedestrians when Birds are flying down sidewalks. Several days later Birds landed in Athens. We are likely next. Morekis is correct in describing their polarizing nature. “The people who love to use Birds really love them. And the people who hate Birds really hate them,” he wrote. That tension was evident at the Aug. 2 meeting of the Georgia Department of Transportation’s Pedestrian Safety Task Team Meeting (I’m a member of the team and call into the meeting, held in Atlanta every month). 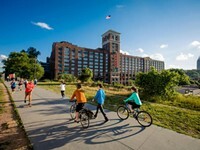 One person described the miraculous effect e-scooters had on his friends in Atlanta, who previously were difficult to separate from their sofas after work and on weekends. Now they are going to concerts, attending art openings, and trying new restaurants, all via Bird. Like Morekis, others were rightly concerned about scooters, both stationary and in use, creating hazards on sidewalks. Another complaint about Birds is the way they seem to be beamed down into cities from outer space. This critique will certainly find purchase here, where monied out of town interests are perceived to always get their way, while local folks are forced to jump through endless regulatory hoops. An Aug. 19 headline out of Cleveland worries, “What are the dangers of electric scooters?” after a woman was killed while riding one there. Read past the headline, however, and you’ll learn the driver snorted heroin shortly before killing her with his Chevy. Yet the headline gives the side-eye to the victim’s choice of transportation. That’s really what e-scooters are all about: transportation choices. 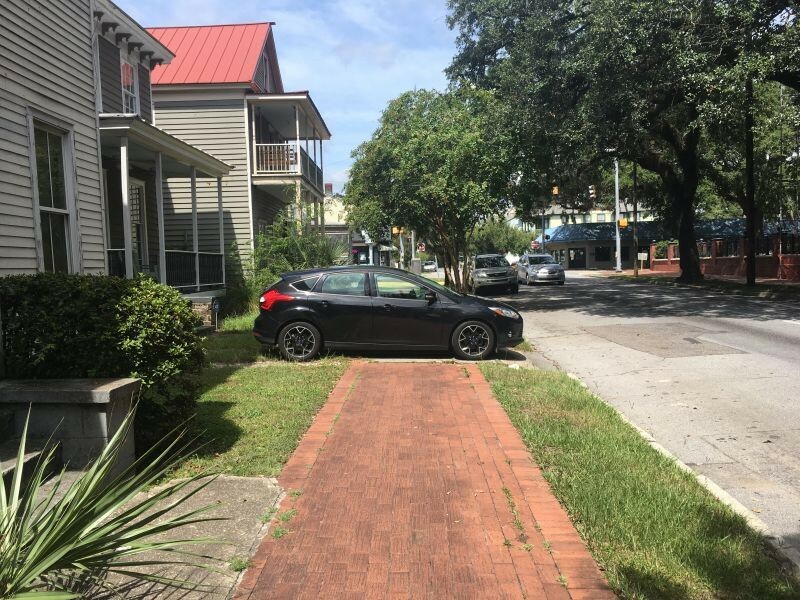 People who walk in Savannah frequently face barriers, like this car parked on the Anderson Street sidewalk. 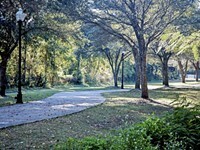 When Bird e-scooters arrive in Savannah will they add to the problems or provide a needed mobility option? I agree 100 percent that e-scooters should not be operated on sidewalks and that those who do so should be ticketed, yet let’s not pretend we don’t know why many people do it. Jerks will be jerks, but people who ride scooters (and bicycles) on sidewalks often are doing so because they perceive it as being safer than riding in the street. As for risks created by parked scooters, people who walk in Savannah already contend with much bigger barriers in the form of cars and trucks routinely parked on or otherwise blocking sidewalks. And people who walk are vulnerable to traffic moving at highway speeds, even in residential areas, which presents a threat many times greater than that which could be posed by even the largest flock of Birds. The real problem is we have given over much of the public realm to cars. People who walk, use wheelchairs, or ride bikes, e-scooters, and new modes of locomotion yet to come are left fighting with each other for the scraps.